Background image is a drawing made by my daughter Hafsah when she was 6 years old. 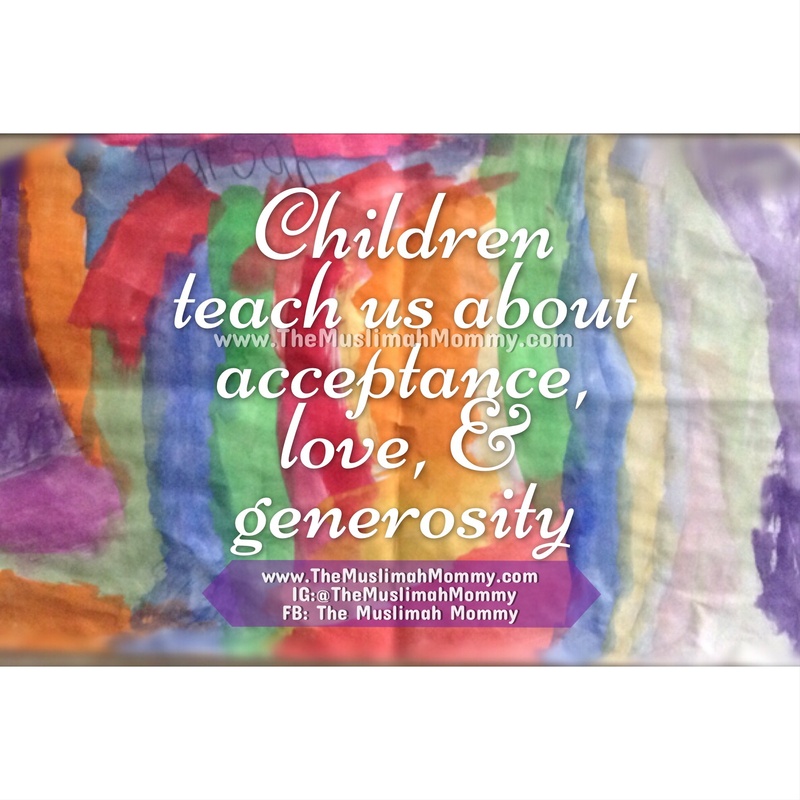 Spend a day with children, and you will learn a lot about acceptance, love, and generosity! Children don’t look at how much money you have, the colour of your skin, or anything else- they will accept you for who you are. My heart melts when I see children at the park play with each other. These children come from different parts of the world and different backgrounds, yet the outer appearance never matters to them- they just want someone to play with. Children don’t hate, they don’t discriminate – they just love. Whenever a child is hurt, it’s beautiful to see other children concerned for that child. Children feel the pain of other children; likewise they embrace the happiness of others. Children give, give, and give some more! It’s special to witness children give what little they have to their friends. Their automatic sense is to share with others, so that others don’t feel left out. I always smile when I see children sharing their snacks and their toys with one another, and what amazes me the most is that they do it without any hesitation. Being a parent has softened my heart and opened my eyes to what we really need in this world- Acceptance, Love, & Generosity! That’s beautiful sis. It’s also important that we, as parents, nurture those compassionate qualities in them by praising them for it, and watching how we behave in their presence. For example sometimes your kid will get hurt after doing something you repeatedly told him/her not to do. You could either acknowledge his/her pain or get upset and say “told you so” which is probably the last thing anyone wants to hear. Just a thought.